SAPTARI, April 8: The first irrigation system, Chandra Irrigation System, was established by the Rana regime in 1920s. The then Rana Prime Minister, Chandra Shamsher is reported to have been so much interested by the infrastructures in England that upon his return he constructed many crucial infrastructures. The Chandra Irrigation System, was one of them. It is believed that Chandra Shamsher was so excited about the irrigation project that he went to India and asked the then East India Company government to send one of their best engineers to Nepal for working on the project. Nearly 90 years after the nation got its first irrigation system, development of infrastructure required for boosting the agriculture sector remains dissatisfactory. Even existing infrastructure are not repaired and maintained. As such, the canal is in a sorry state. In its actual capacity, the Chandra Irrigation System irrigated over 10,000 hectors of land. Owing to this irrigation facility, productivity of land in Phattepur market area had increased by manifolds. However, over the years, the canal’s capacity has dwindled. In lack of regular maintenance and repairs, presently its capacity has been reduced to around 500 hectors. Chandra canal is listed as one of the country’s historical heritages. However, the title has not in anyways assisted in maintaining its purpose. Farmers lament despite being an agricultural country, the state has completely ignored the irrigation system. They claim that if repaired and restored to its original glory, the canal would still make a huge contribution to the irrigation sector. Some of the locals even accused authorities concerned of pocketing the budget that is allocated for repairing the canal. “If the budget allocated for maintaining the canal would have been spent for the purpose, the canal would have been in shape. But the poor condition of the irrigation system speaks for itself. Not even a dime has been spent to repair it,” a local farmer said while requesting anonymity. “Farmers would have been so elated when this canal came into existence and irrigated their land. Through these years, the canal has catered to the needs of so many farmers by irrigating their farms. But due to the lack of attention by authorities concerned, it has gradually lost its efficiency,” said another local farmer Murari Karki. He added that there are 11 sub cannals and 38 direct outlets in the irrigation system. “The days of its glory are over. Instead of being a crucial infrastructure to our farms, it’s now more of a risk to our settlements. Its weak and dilapidated infrastructure poses risk of flooding,” Karki stated. He claimed that if the canal’s source dam is not repaired and maintained properly, it might give in to the pressure of water from the Saptakoshi River during heavy rainfall. Such concerns worry residents in the area, he shared. Badrimahatman Yadav, president of the Chandranahar Water Consumers’ Committee pointed out to the issue of encroachment of land by land mafias. He said that much of the land under the irrigation system has been gradually privatized. “We have been following this closely. While on one hand the canal system is in need of massive repairs, on the other hand, we need to free it from land mafias. 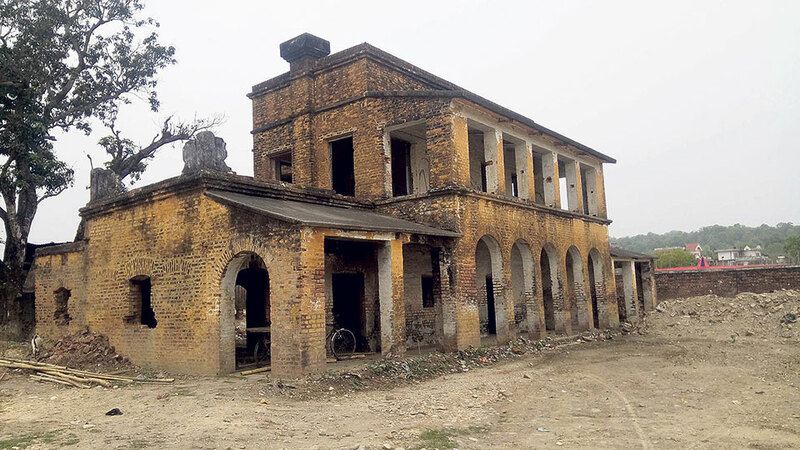 Much of its land has been encroached by mafias,” Yadav said. A civil society leader Ashok Chaudhari stated that farmers in Saptari have been facing acute shortage of water for agricultural purpose. Considering their woes, he asserted that the government should at least save existing irrigation system while develops new infrastructure. “It would be another matter, if this irrigation system was not there. Since it is there, we should take care of it and benefit from it. Today, if we have to construct such irrigation system how much would it cost? The government should consider this simple fact and take care of it,” he noted. Farmers state that their agriculture production capacity would be more than double if they are provided with irrigation facility. Due to their dependence on mostly rain water, their production capacity has been severely affected, they claim. “Dependence on rain water affects the quality and quantity of agriculture produce. An agricultural economy like ours must address farmers’ concern with utmost priority,” Chaudhari said. “Considering the state of Chandra canal, it is evident nobody cares about doing the right thing,” Chaudhari said. BAITADI, July 16: Seven shops were swept away by flood at Chainpur, the district headquarters of Bajhang, on Friday evening.